The dashboard is your control centre. It tells you every important thing you need to know when you’re driving along including your speed, how much fuel you have on board, your oil temperature and whether your lights are on or not. Of these, none actually worked. Absolutely none of them. Other things on the dashboard include the milometer thing that tells you how many miles you’ve done. That didn’t work either. But the little red battery and oil lights worked. And when I say work I mean they lit up when you turned the ignition key. Whether they would come on as a warning light, should you have a problem, is unknown. The only thing that did work with certainty was the green indicator light. Confusingly, indicator lights only work if they’re on the blink. It’s tricky not knowing how much fuel you have on board. At the rate the bus consumes petrol its actually quite important to know how much fuel you have if you want to avoid the long walk back down the hard shoulder to the petrol station. But you could work out fuel consumption by recording miles travelled since you last filled up. Ah yes. The speedo cable was broken, so no mileage in that idea. I think the bus does something like 22mpg, but I’m not sure because we never know how far we’ve travelled on a full tank. To get round this we use Satnav which tells you how many miles to your destination. This works OK so long as you don’t do detours and you add up subsequent journeys along the way and it doesn’t run out of battery (the satnav is powered via the cigarette lighter – didn’t work either). The closest we’ve got to being empty is when I filled the bus up with 41.5 litres. Given the tank has a 40 litre capacity this meant we’d done the last few miles on minus 1.5 litres of fuel. To be honest I should have just carried on driving for ever and ever if the bus could run on empty. Either that or the petrol station was on the weights and measures fiddle. Personally, I think I may have stumbled across perpetual motion. This fuel gauge thing clearly needed to be fixed, and fortunately the previous owner gave us a spare dashboard which included the funny fuel needle regulator switch thing that I assume recieves a signal sent by the fuel tank dip stick thing that registers how much fuel the tank has in it. I swapped over the dashboards carefully making sure I recorded the exact locations and colours of the 12 or so wires plugged into the back of it. You can never be too sure, so good planning on my part. The speedo still didn’t work on the newer dashboard, but the fuel needle did. Previously the needle never budged from Empty. Now it rose to Full before settling on somewhere around half full. And it’s stayed like that regardless of whether the tank is full, empty or anywhere in between. Brilliant. 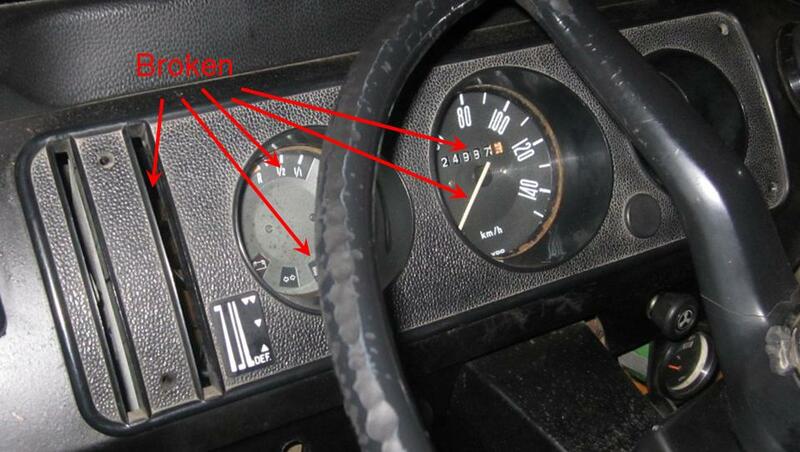 At least the newer dashboard didn’t have rusty numbers on the speedo that didn’t work. I plugged in all the wires as per my notes and checked everything still worked. And they did. Except the full beam lights. I don’t know why they didn’t. But on the whole I was pretty pleased with my work. I had less things working than before but I had taken something apart and put it back together again and the bus still started. That, in my book, is a big achievement. OK, so there was another thing that stopped working too. The oil temperature gauge. This makes Sarah paranoid because we won’t know if the engine is getting too hot and the bus might catch on fire and Conker’s on the back seat and we won’t be able to stop because the traffic is too busy and we’re all going to burn to a crisp and then what are we going to do? I must admit if it comes to this our options are limited. So, to get round this we all dress up in fire retardant clothing, including Conker, and cover our face and hands in fire retardant jelly. Get this. Fire retardant jelly, like the stuff stunt men use to stop them burning (so quickly) is actually petroleum based! Can you believe that! Nuts. Absolute nuts. We don’t really dress up in fire retardant clothing. That would be stupid. And we’re not stupid people. Not all of us anyway. We did buy a fire extinguisher though. This means it can never happen to us. It’s our insurance. Because if we didn’t have one you can bet your bottom dollar the bus would set itself alight. I don’t know what all the worry is really, I mean buses don’t just set themselves alight because the engine gets a bit hot do they? Fire needs fuel to burn otherwise you can’t have a fire can you? Come on…Think about it. Talking of which, I really must find the source of that fuel smell that stinks the bus out whenever we fill up.